A couple of years ago I presented a preamplifier on my homepage which allowed it to use standard oscilloscope probes on the line input of a soundcard. This small circuit solved the problem that a soundcard has quite a low impedance on its line inputs which makes it unusable for measuring high-impedance signals. 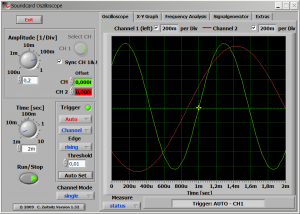 Already at that time I found quite a few application programs to use the soundcard as a simple and cheap storage oscilloscope, but nobody seemed to bother about the impedance issue or any way to connect oscilloscope probes to a soundcard. My previous design used a single-supply operational amplifier and a 9 V battery to offer a standardized input impedance of 1 MΩ at the input and buffer the input signal which is then capacitively coupled into the line input of a soundcard. A directly coupled signal would have required a surgical procedure on the soundcard itself, which I deemed too risky. Now, you can buy external USB soundcards for cheap money and about a year ago I got the idea to modify such a card for a DC connection of the input signal. 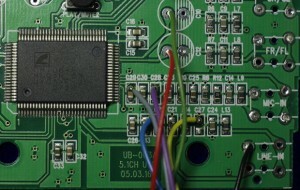 In 2008 also the electronics journal Elektor took again up the idea of using the soundcard for electronic measurements. So now I finally went all the way and designed a universal input/output circuitry which can be adapted to different soundcards and offers two input channels with a standardized input impedance of 1 MΩ and two low-impedance, DC connected output channels which can drive an amplitude of 1 V into a 40 Ω load. My design is based on the USB soundcard SC-5500P from Trust which is based on the CMedia USB sound chip CM106. From the datasheet of this chip you can see that it uses a single +5 V supply voltage and handles negative amplitudes of sound signals by offsetting these with a reference voltage of +2.25 V which is available on pin 38 of the QFP100-package for the connection of external bypass capacitors. 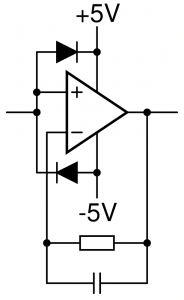 In order to connect a signal to the inputs of this chip without coupling capacitors you have to add this reference voltage to the signal, when taking the output signal you would have to subtract this voltage from the signal – this can easily be done with operational amplifiers. The 5.1 soundcard comes with 2 stereo output channels, 1 mono output channel, 1 stereo line-in channel and 1 mono microphone input channel (the chip itself actually supports stereo microphone input, but this is not externally available). Since the soundcard itself is powered from USB, a single +5 V supply voltage is available on the card. Also the current which can be drawn from this supply is limited, but since I am only adding a handful of operational amplifiers and limit the output current from the signal output this is not a problem. In order to work with directly coupled positive and negative signals, a negative supply voltage is needed. 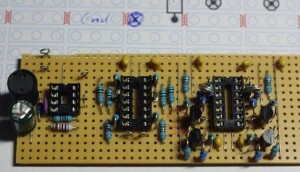 I chose to create this supply voltage with a small DC/DC converter based on the MC34063 chip. A first also showed that it was necessary to buffer the reference voltage from the sound chip itself, because the sound chip was not able to drive the four inputs where I needed the reference voltage (one for each input channel and one for each output channel). Therefore I had to add a voltage follower based on a single operational amplifier. The input circuit consists of a voltage follower with an input impedance of 1 MΩ followed by a voltage adder which takes the 2.25 V reference voltage from the soundcard and adds it to the input signal. This way a symmetric sine wave with an amplitude of 1 V would be transformed into a sine wave swinging between 1.25 V and 3.25 V which is then fed into the sound chips analog-to-digital converter inputs. All the conversion for both channels is performed in a single quad operational amplifier package. I chose the TL074, but for this application the exact type of operational amplifier is not critical. The total amplification of the two stages is 1 – i.e. the input signal is presented to the sound chip with unchanged amplitude. 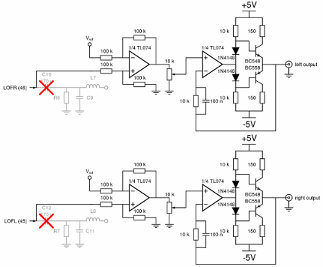 At the very input you can easily implement an attenuator as found on conventional oscilloscopes, allowing you to take only 1/10 or any other fraction of the input signal – I realized a selectable 1/10 attenuation in this circuit. In order to connect it to the soundcard with no interference with the original input circuitry I removed the coupling capacitors (C22 and C27, SMD 3 μF) and soldered the connection cable to one of the solder pads of these capacitors. Apart from an oscilloscope a signal generator is also a very important tool in an electronics workshop. And some soundcard oscilloscope software also provides means to send output signals to the soundcard, emulating a signal generator. Again the original output circuit of a soundcard might not be up to the task and especially its specifications are almost certainly unknown. I therefore even designed an output stage. It also consists of two operational amplifiers per channel – one to subtract the 2.25 V reference voltage from the sound chips output signal, and the second one to drive a complementary pair of bipolar transistors. This is not a real power amplifier and the signal amplitude is limited to the actual output voltage of the sound chip, since the two operational amplifier stages have an amplification of 1. But it is able to drive a signal with a 1 V amplitude into a standard 50 Ω load with low distortion. In order to connect it to the soundcard, I removed the original coupling capacitors (C10 and C12, 470 μF through-hole) and attached wires to one of these capacitors pads on the circuit board. Assembling the circuit on the stripboard according to the printed design. Soldering the connection wires to the corresponding pads on the soundcard. Connecting the amplifier board with the soundcard inside the box. You can notice the still absent voltage follower for the reference voltage on the stripboard - I added it after a failed first test. 440 Hz sine wave from the soundcard and 880 Hz sine wave from a signal generator on a Hameg 60 MHz analog oscilloscope. 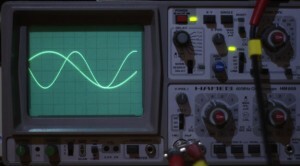 The same two signals as above, 440 Hz sine wave from the soundcard and 880 Hz sine wave from a signal generator, seen on the computer screen. There seem to be several applications around on the internet, which can use the soundcard as an oscilloscope. Earlier I was advertising a program called audioTester from http://www.audiotester.de/ on my homepage. It also has seen an upgrade in the recent years, but I haven’t tested it again, yet. 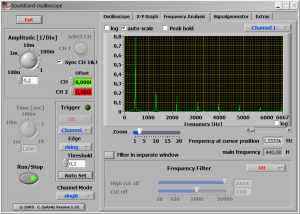 Recently I found another program from Germany, Soundcard Oscilloscope from http://www.zeitnitz.de/. This program allows to control the soundcard output as quite a versatile signal generator, including a noise source, frequency sweep and adjustable phase delay between the two channels. It offers a two channel scope display with cursors and various trigger settings, an independent X-Y display and a spectrum analyzer. It also allows to highpass/lowpass/bandpass/notch filter the input signal and display the result on the scope screen. The Soundcard Oscilloscope software is free for private and educational use, but I chose to register my copy of the software and plan to contact the author soon with some additional suggestions, but also some flaws which I think I have discovered. Spectrum display of a 440 Hz square wave signal fed back from the soundcard output through the amplifier card into the input. to examine 5v logic waveforms using a fet wired as a follower, then attenuating its output to match the sound card input impedance. 30 and 40 to suit the high input signal. See further useful advice in my article. if you chose the same values as I did, i.e. 10 kohm for the pots, then no, that cannot be the reason. The output of the opamps has an impedance in the order of 100 ohms and can be completely neglected in this context. Are you sure you connected the pots correctly? Also what do you mean when you write that the sound card “stops responding”? Do you get an error message, or just a constant zero reading? And finally: I do not have problems with the volume control under Windows either, however, since this is used for audio applications it most probably follows a logarithmic scale. However, the controls in the software I recommended works linear with very fine control. I used your circuit as inspiration for my pc based V-I curve tracer. I get around the dc offset being upset when adjusting the gain pot, I added another stage of op amps and added the offset after the gain adjustment is made. For me it made the gain adjustment a lot easier, you don’t need to make any adjustment to the software dc offset. it depends a bit on what your plans are. Of course a couple of clamping diodes at the input of the operational amplifier cannot do any harm, but I would not rely on them as a fool-proof protection circuit either. Honestly, the only problem I once had with this type of circuit was caused by a short-circuit through the grounded shield of the BNC connector and those diodes will not prevent you from errors like this. The clamping circuit you found is not suitable, however, because it relies on very small and asymmetric signals at the input of the operational amplifier. 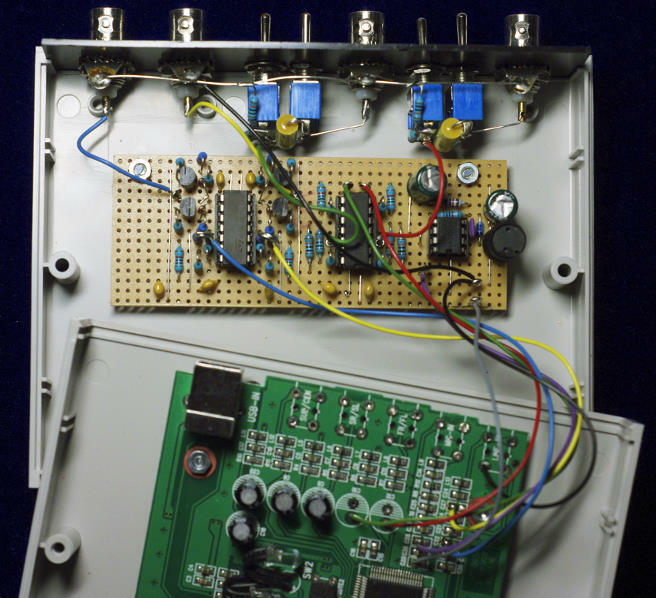 Input protection for the operational amplifiers. The diodes are standard silicon diodes, e.g. 1N4148 or 1N914. Do you think that i can mod this usb sound card? my Italian is not very good, but most compact USB sound cards I have seen so far only have a mono microphone input, even though most chipsets support stereo inputs. Another problem will be that this card probably is very compact on the inside – it might not be easy to do the soldering. On the other hand, for just EUR 4.40 it might well be worth a try! Thanks for a great article, all very clear and easy to understand. I’ve started building one of these and come across a problem with your -5V supply circuit. As shown it will not work, because the 100k current sampling resistor on pin 7 of the MC34063 is far too big. It needs to be less than 1 ohm! The 150nF capacitor that sets the oscillator frequency is also too high, it should be nearer to 470pF. With these values my circuit works just fine. Hi Mike – and thanks for your comments! You are absolutely right about the resistor and the capacitor. You are the first to comment on these obvious mistakes from my side and I can assure you that these are merely typos. If you look at the photo of the circuit board, you will see the socket for the MC34063 to the far left. There you can see that I use a wire bridge instead of the resistor between Vcc and pin 7 – this will disable the over-current protection of the chip, but it works nonetheless. And the capacitor in my circuit is actually 150p and not 150n. I have built the circuit and got it working, and wondered how you calibrated yours? I measured an RMS voltage using a multimeter then tried to set the scope to the equivalent pk-pk value. The Windows volume control is too coarse, and the 10k pot feeding the input to the sound card doesn’t work very well. As the wiper leaves the top of the pot the sound card stops responding (possibly because the op amp output impedance has risen?). Any tips here please? Be careful with ac multimeter measurements – the frequency range of digital multimeters is normally quite poor and if your signal is not around 50-60Hz I would not trust the multimeter to read the correct rms voltage at all. I myself have the luxury to own a “real” oscilloscope for comparison, otherwise I would recommend you to build a simple 1kHz (or so) square wave oscillator, e.g. from an NE555. It should give you a peak-peak voltage equal to the supply voltage of the NE555 which you can use for calibration. About the sound card not reacting to the pot unless it is at its “top” position: what kind of pot did you use? The regular input impedance of the sound card should be 10kohm or higher so with a 10kohm pot as in my drawing the change in output impedance of the driving opamp should not have such a consequence. At mid-position the output impedance of the driving stage has reached its maximum value with (5kohm parallel 5kohm) plus the opamp’s output impedance of about 100ohms, i.e. about 2.6kohm. Yes, this gives an additional attenuation leading to a non-linear behavior of the pot-setting, but this non-linearity is less than 20%. Could there be a different reason for this behavior of the pot in your circuit? OK I’ll use a lower frequency with the multimeter (or even dc from a battery?). The pots I used were 10k presets but I’ve taken them out now and can get by without them. I’m very pleased with your design and have already used it to diagnose and repair a vintage CD player! Great article. I have the same sound card. I wonder if your design would allow me to view very low sine frequency. Say between 0.01 and 1 Hz. What is the lowest practical sine frequency it can handle? When you bypass the coupling capacitors there is absolutely no lower frequency limit. 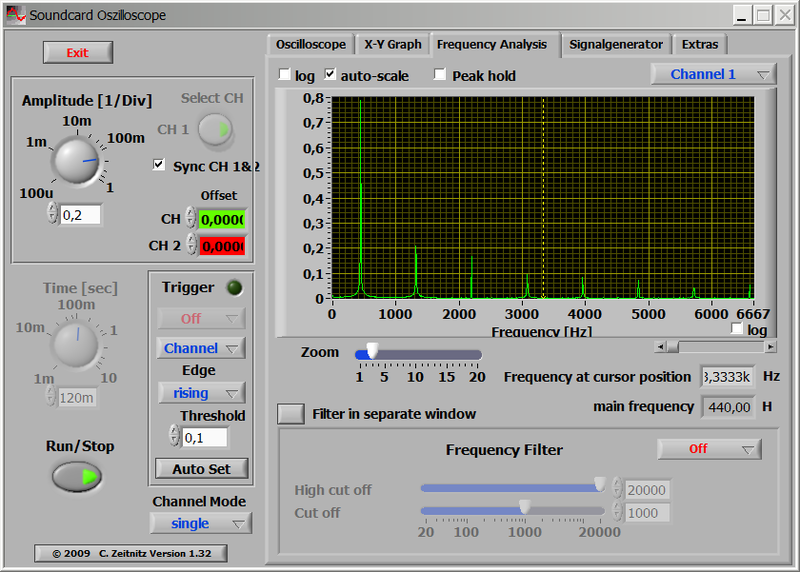 The scope software by Zeitnitz has a lowest setting of 10 sec per div. The idea of the sound amplifier as a sound card has been very helpful for me. I am using this as a preamplifier. The way you described the entire hardware and the circuits was very informative for me. The detailed description of the software part was also very much helpful. Hats off to you guys. This schematic could be used on a normal soundcard? 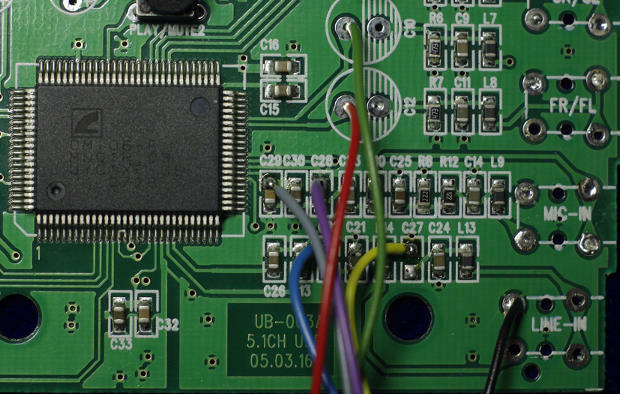 You need to identify the corresponding input and output pins of the integrated circuits, but otherwise there is no difference between an USB sound card and a traditional one. However, since the traditional soundcard has been on the verge of extinction for quite a while now, the functinality will most often be found in some corner of the mainboard instead. This involves the risk of soldering and operating on your mainboard and if you are not sure what you are doing and how you are doing it, there is a risk of permanently damaging your whole computer. Thanks!I have an old creative 5channels,i have to find the inputs and outputs on the main cip?bypassing the rest of the components? In order to allow DC signals you will need to bypass all additional input circuitry, which mostly consists of a capacitor as high-pass filter. If you are only interested in AC signals in the standard range of the sound card you can use a simpler circuit like this older post of mine. Why not try to use video capture device for high frequency sampling? Do you ever think about it? Sure – you can use video-ADCs for high-speed sampling and I planned something like this over 20 years ago. However, at these speeds also the analog frontend gets more demanding. When it comes to a dedicated video capture device the main problem is the synchronization, because these devices are built to extract the video information (chroma + luma, ord RGB and sync) from the analog video signal. I presented this project, because I think that an oscilloscope is one of the essential instruments for electronics on any level. The available bandwidth of a sound card is enough to cover a lot of needs – for higher frequencies I myself use a commercial 50MHz analog CRT oscilloscope and in my own projects I had so far never the need for anything faster than that. I think you are comparing two completely different price ranges here. Of course a professional analog or DSP spectrum analyzer is largely superior to what you can achieve with a cheap software FFT combined with a cheap USB soundcard. However, a DSP spectrum analyzer is most probably not affordable for the hobbyist. And the hobbyist might probably not need its added features and possibilities. I liked your circuit but found it limiting. I have a CRT scope for genral use but having a laptop scope is handy when out and about. The laptop sound card is AC coupled on line. What I needed was an attenuater/amplyfyer to increase the range from 0v to 500v. Two final safety features an additional 1M in front of resister chain (divides voltage by 2 hence 2000 amp). and a diode from the first amp +ve input to Vref, this ensures the input voltage is never above 5v, if 12 way switch in the wrong position. I also found the no need for the 100k resister from vref to 2nd amp +ve. Thanks for your description! I’m looking forward to see your posting on your website! thank you for the great article. I find it extremely useful and also have a couple of technical questions about the scope. First, what are the specs of the scope – do you know what is the effective sampling rate and the effective resolution you get? If I understand it right, in 1:1 mode you can analyze a signal from -2.25V to +2.25V, i.e. 0-5V input and in 1:10 -22.5V to +22.5V. And furthermore, is the USB port protected from the input circuit, for example if you lift the ground from the BNC or have a faulty BNC connection? When it comes to protection: forget it! The USB port itself is one of the safer connections on a normal PC, but when you apply a high enough voltage you will at least blow the USB port, but I can imagine that you can blow up your computer. You should also observe that the ground level of the soundcard is not isolated from the ground level of the PC and most likely also connected to the ground-earth (PE) of your power line. I live in the Twin Cities (Minnesota) I’ll build a home, and i also am wondering of becoming environmentally friendly, I will most likely not perform some of the “ecologically friendly things” like employing all reused elements, or even bamboo floorboards, but more so, radiant flooring heating, all Energy Star appliances (even getting an LED TV), Tankless hot water heater, french drain standard water collection (for water the garden) LED lamps, spray foam insulation etc. Will it be the better choice to get solar energy panels? I recognize that constructing rather of shopping for will save me 15% but really going complete alternative costs over 45% extra. This looks to be a very active site. How do you manage to keep up with approving all the comments? hey there and thank you for your info – I’ve certainly picked up something new from proper here. I did then again expertise a few technical issues the usage of this website, as I experienced to reload the website lots of instances prior to I may get it to load properly. I were brooding about in case your web hosting is OK? Now not that I’m complaining, however sluggish loading circumstances instances will often have an effect on your placement in google and can harm your quality score if ads and ***********|advertising|advertising|advertising and *********** with Adwords. Anyway I’m adding this RSS to my e-mail and can glance out for a lot more of your respective intriguing content. Make sure you update this once more very soon.. It might sound weird but my browser does notseem to be capable to d isplay your article rightly?- It looks like a whole chunk of if just isn’t accurately d isplayed plus the layout from the page does notappear to be ideal. Are you able to confirm that th is publish continues to be set up for Opera? I have no problem with the display on Opera…. Thank you for an additional fantastic blog. Where else could one get that sort of information written in such an ideal way? I have a presentation that i’m presently functioning on, and that i are probing for such information instead. Great post. Continue to keep more interesting publications. Been following blog for Three days now and I should say I am starting to much like your post. I need to know how can I subscribeto your blog? My plots would suggest that you shuold run the LIN out settings on the K3 as high as you require to drive your soundcard correctly. The amount of distortion present on the lin out does not seem to increase as the output level is turned up on my K3, it actually decreases.Ghosts on the waterfall shuold be dealt with by choosing an appropriate filter and filter centre frequency as well as setting the dynamic range of your waterfall appropriately.Your mileage may vary and each setup is different. Nice post. I was checking constantly this blog and I am impressed! Extremely helpful information specifically the last part 🙂 I care for such information much. I was looking for this certain info for a long time. Thank you and good luck. Thank you for sharing this nice article. I am still confused with RSS 1.0 or 2.0, how do you know the difference? Ineed a good RSS for my blog but it accept only 2.0 feed, is yours a 2.0? Took me time to read some the comments, however I actually enjoyed the post. It proved to be quite beneficial to me and I am positive to all the commenters right here! It’s always good when you can not only be informed, but also entertained! I have to point out my affection for your generosity in support of persons that have the need for guidance on this important concept. Your very own dedication to passing the message up and down ended up being definitely beneficial and have in every case empowered individuals like me to get to their pursuits. Your personal informative hints and tips indicates a great deal a person like me and especially to my mates. Thanks a lot; from each one of us. I don’t know the difference between RSS 1.0 and 2.0, but the WordPress installation I am using uses RSS 2.0 feeds. I uncovered your blog utilizing google and I must say, this is among the best nicely written articles I’ve seen in a lengthy time. I have bookmarked your web site for further posts. Hi! I saw your blog at Google and have learned a lot from it. Thank you very much for the useful and detailed posts. Will be coming back soon.